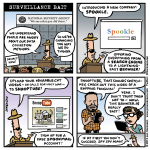 I find the NSA Prism program — what I know about it, anyway — to be problematic. But it does seem there’s a disconnect between public reaction to this particular scandal and our tolerance for the selling of highly-personalized data by tech companies in the private sector. I’ve read over the years about evolving technologies to offer individuals different prices and interest rates based on data collected through the internet; I have no idea how much this is actually happening, but the potential for abuse seems vast. I’m not trying to suggest an either/or situation here in which government spying is OK and private sector data mining is not. The potential for abuse by the state is enormous and well-precedented. But Silicon Valley is no saint here; many tech libertarians seem to overlook this. Private data could be used to deny people health insurance and harm their credit — it goes beyond mere advertising. The arrangement with the Prism program just seems to me like foxes working with foxes guarding the henhouse. Somewhat amusingly, while I was working on this very cartoon, I watched a music video on YouTube — The New Pornographers’ “Slow Descent into Alcoholism” — and immediately afterward was served Google ads for various detox programs. So there’s one particular data point on my record that might not be so accurate. At least, not currently.